After a somewhat frantic effort yesterday of trying to place the mystery glass plate negatives I found, with help from various individuals we have got some results! My colleague Lucy Hermann, Sally England from Hackney Archives, Dr Andrew Jackson from Bishop Grosseteste University in Lincoln and Sara Hodson, the Museum Manager at Ilfracombe Museum have all massively helped to try and unravel the mystery. I thought I would share the findings with you while the topic was still hot! 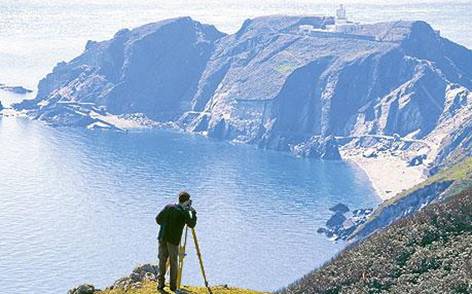 We have all come to the conclusion that the image below is definitely from Lundy Island in the Bristol Channel. I found a more modern image of the same place, and I am sure you will all agree, they look pretty much identical! 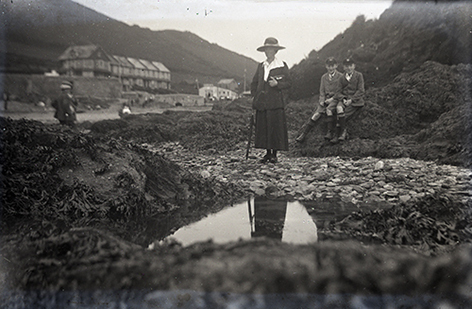 The image below the glass plate negative is from a Telegraph article entitled Hiking on Lundy Island with Nicholas Crane and is a National Trust image. The Lundy connection was confirmed by Sally after an initial discovery by Lucy. Sally also then steered us towards Devon for the rest of the images, and Andrew chipped in saying the coastal town looked like Ilfracombe and suggested I got in touch with Sara at Ilfracombe Museum. She was very prompt in her reply and much to my joy, the locations started to unravel. The above image is of Ilfracombe Harbour, with St Nicholas’ Chapel to the left of the image. The chapel was constructed in 1857, so the glass plates will date from after that year – which means our guess of around 1910 may well be right. 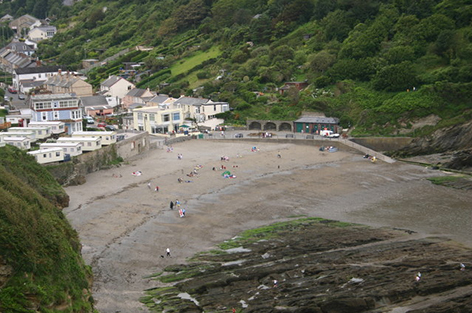 The images below have been identified as Hele Beach, which is just outside of Ilfracombe. The bay looks very different now to what it did – though in some photographs from the 1940s and 50s still seem to have the row of houses which you can see in the distance in the mystery glass plate. The modern image below has been taken by Shaun Ferguson and was found on the Geograph website. 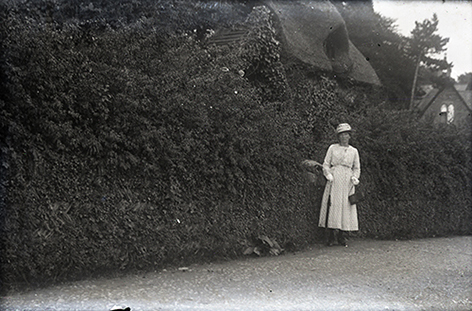 The next image (see below) was identified as being Old Maids Cottage in Lee, just outside of Ilfracombe. This house is now rented out as a holiday cottage. There are a few photographs of it from the late 1800s on the Francis Firth website. The cottage itself dates from 1765 and was once home to three beautiful young ladies who were very picky about their perspective husbands. They ended up unmarried and were known as the Three Old Maids of Lee. There is a poem about them, written by Frederick Weatherly. You can read the poem on the Devon Heritage website. 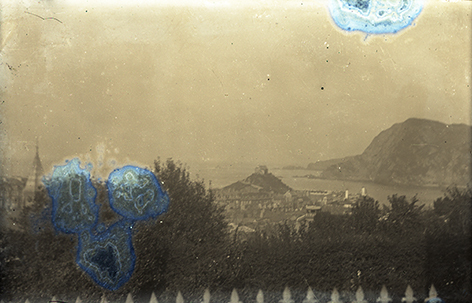 The two final images of the family sitting on the terrace have obviously been taken at the same house as image one, overlooking the now identified Ilfracombe Harbour. This has been given a possible location of Rupertswood Terrace in the town. The second, very blurry image of the boy on a beach in yesterday’s blog entry still remains a mystery – but one mystery out of seven is not bad going at all in such a short space of time! 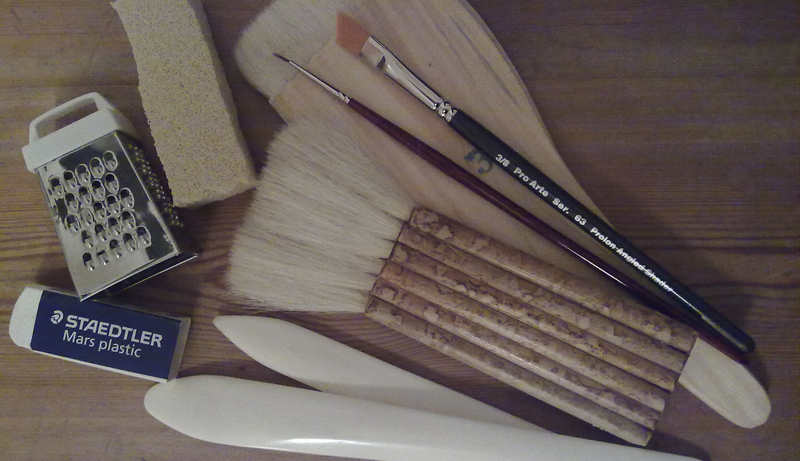 I am so happy and grateful to the aforementioned people who were willing to share their knowledge and help me out! 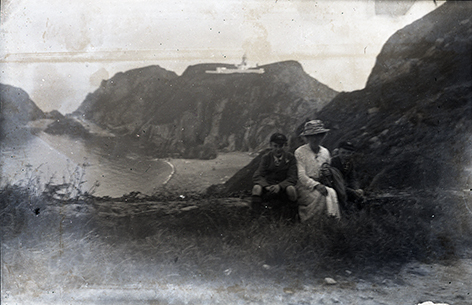 The family in these images must have taken a holiday around the Devon coast, with a visit to Lundy Island by boat. As Sara mentioned in one of her replies to my email, “it was quite a common past-time for tourists to take a horse-drawn coach to these destinations on the Devon coast”.